Bought this for my son who lives in Florida and he loves it. Perfect for his condo balcony. Enjoy food and drinks al fresco on your deck or patio with this five-piece bistro set. This bar-height bistro set adds a contemporary look to your outdoor space, and is available in four colors to complement your decor. 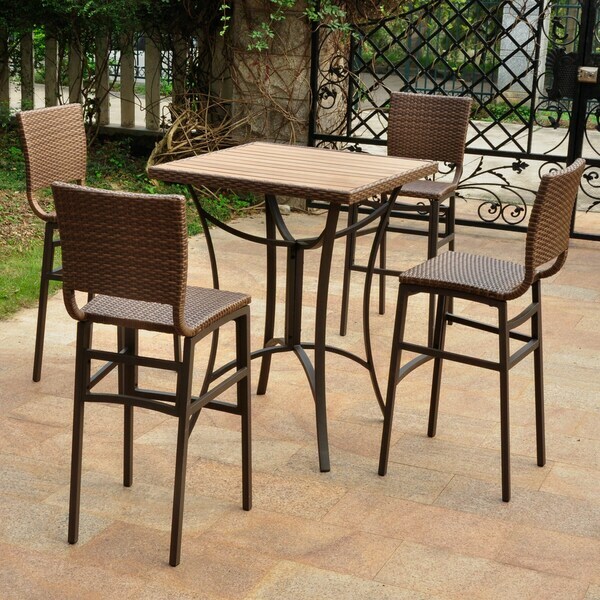 Constructed of natural resin wicker weave, aluminum and wood, this bistro set is made to withstand the outdoor elements and look stylish for years to come. This set fits nicely on my small porch. The table and chairs were very easy to build with the included tools and very sturdy once complete. They're light, which is great for moving them around, although one of the chairs blew over in the wind once, so there are pros and cons to the weight. The table top is synthetic wood and his held up nicely against the elements. I love this product, as it's sturdy, comfortable, and attractive. It is perfect on my lanai, as there is a decorative, high block wall, and this set is just the right height, so I can see the beautiful view of the golf course in my complex. It was very simple to construct. The only issue I had was the delivery. Originally, the tracking website showed one date, so I canceled a luncheon for which I was going. The next morning, the date changed, to the following day for which I was to meet a group. In hopes of not missing this event, I called Fedex and was informed that they could not tell me a better estimated time until the following morning. In the morning, I called, and the customer service rep sent a message to the drive which was unresponsive. Several times, through the day, I attempted to get a better ETD with the same negative results, so I missed my event for the second day in a row. However, when I called Overstock on my delivery issue, they did provide me with a $* credit. Thank you, Overstock. Looks exactly as pictured although I was surprised at how light the chairs and table are. Will plan to secure them to the deck railing as I think a good gust could throw them over! Comfortable chairs and the height is perfect to enjoy the lake view. This set is exactly as shown in the picture. We use it on a balcony of our condo overlooking the Atlantic Ocean. That way because of the height of the chairs we do not see the balcony when seated just the ocean. Also comfortable during the duration of drinks and dinner. I knew this would be a light weight set from the reviews I read, but assumed it would be well made. We had to drill a missing hole in one frame, and we're still trying to figure out how to deal with a missing insert that you screw the screw into, (maybe liquid wood and a wood screw?). I'd return it but don't want to deal with the hassle. It's not comfortable unless you put your feet on the rungs. Otherwise it looks pretty good. I'm not impressed with the quality though. For the price, I expected more solid quality. They are okay and look a little cheap. Make of quality steel. Hasn’t rusted and it’s been outside for over 6 months. Gets lots of compliments. Chairs are very sturdy with no wobble. Would defiantly recommend. Was looking for the nice set to place on my ocean view balcony. Found the Perfect solution at overstock at a very much comparable price. Never purchase at overstock before but will continue ordering there in the future!. Great customer service. Great site. Very pleased. "Can you cut hole for umbrella "
"Which is the darker option - Chocolate or Antique Black? Do all of the available colors have black iron table/chair legs?" "Does the supplier recommend a particular patio furniture cover for this set?" We are not aware of their recommendation. No, these chairs cannot be stacked. "I love this set and having a smaller patio it might just fit the bill. I do need some additional seating are there any accompanying pieces to this like lounge chairs or adjustable high back chairs and small table?" "Is the top wood or fake wood (resin)?" Hello kaetherington, this is made of resin wicker. Thanks for shopping with us!